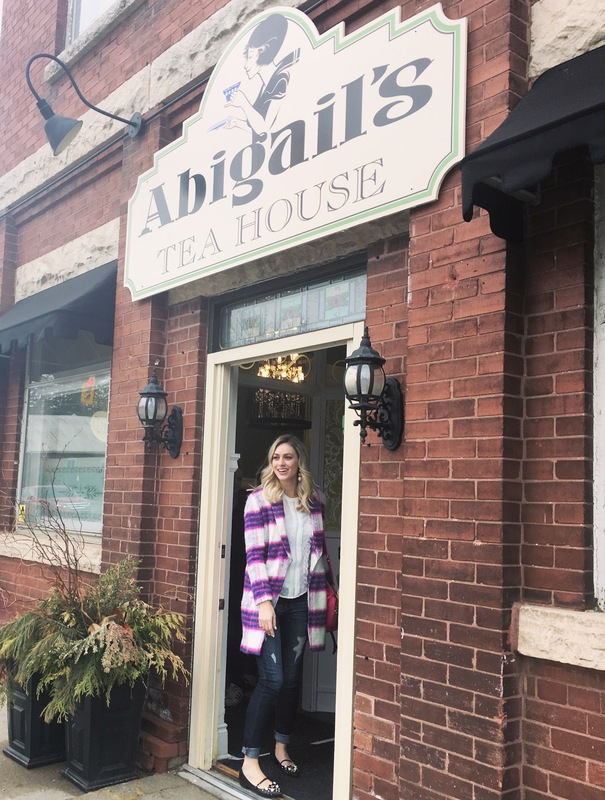 Last weekend I visited Abigail’s Teahouse located in the historic friendly village of St. George, Ontario (about an hour from downtown Toronto towards Hamilton.) I made reservations for 4 people ahead of time knowing that space is limited and that it can fill up on weekends. I made the reservation online late the night before and by 7:00 am the next morning I had already received a confirmation back with my booking. 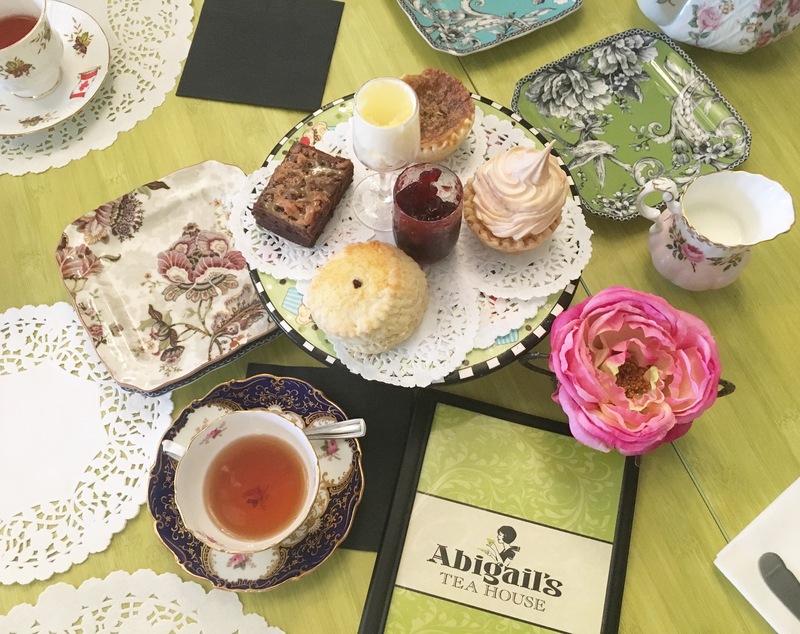 Abigail’s is open Tuesday-Saturday 11:00 am- 4:00 p.m. Now that Spring is in full bloom, Abigail’s Tea House will be open on Sundays from 11 am until 4 pm You can make reservations on the online reservation system or by calling (519)448-3999. 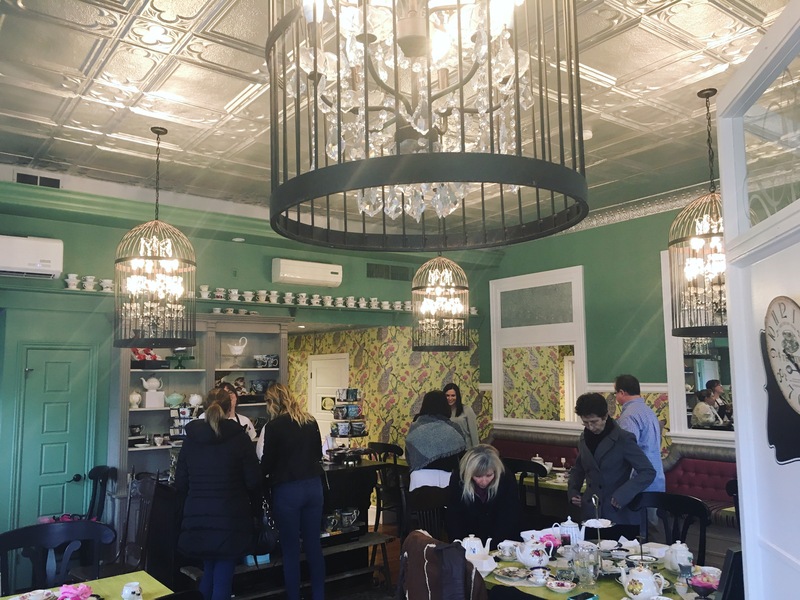 The Teahouse itself has some pretty cool history behind it, and is bursting with a ton of small-town charm! It had originally been the old Bank of Montreal building before its transformation. 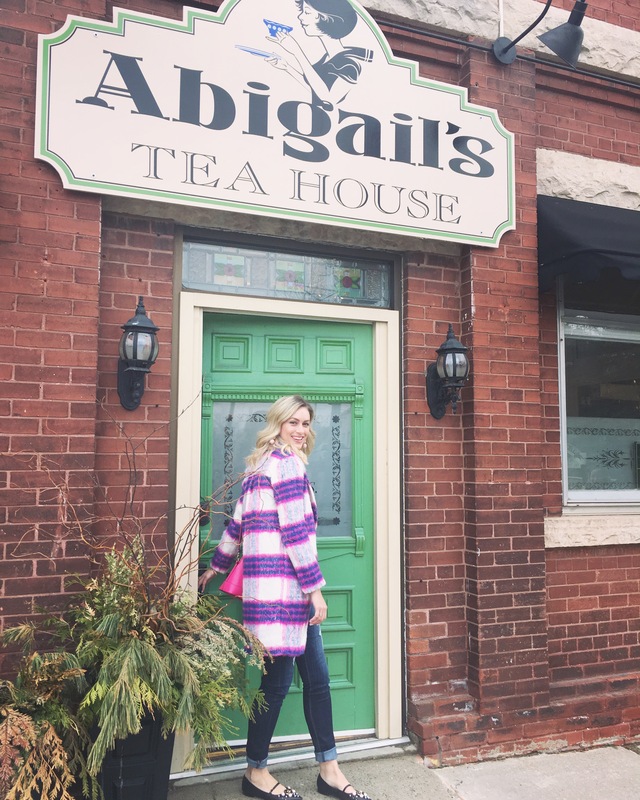 It’s situated right at the middle of Main Street, you can’t miss it, there is only one traffic light in town and you’ll see Abigail’s bright green door. 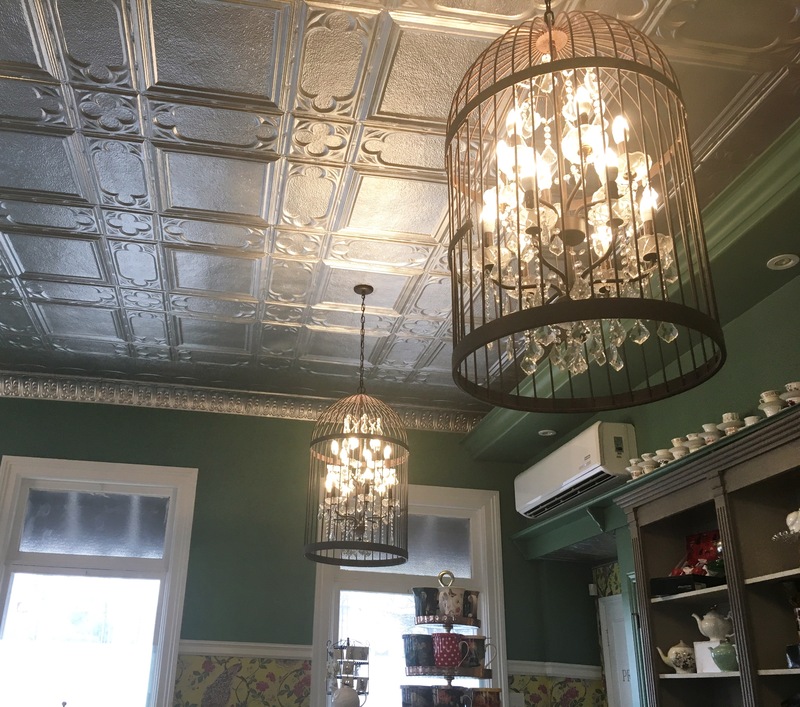 When you first step into the teahouse you automatically fall in love with the décor. 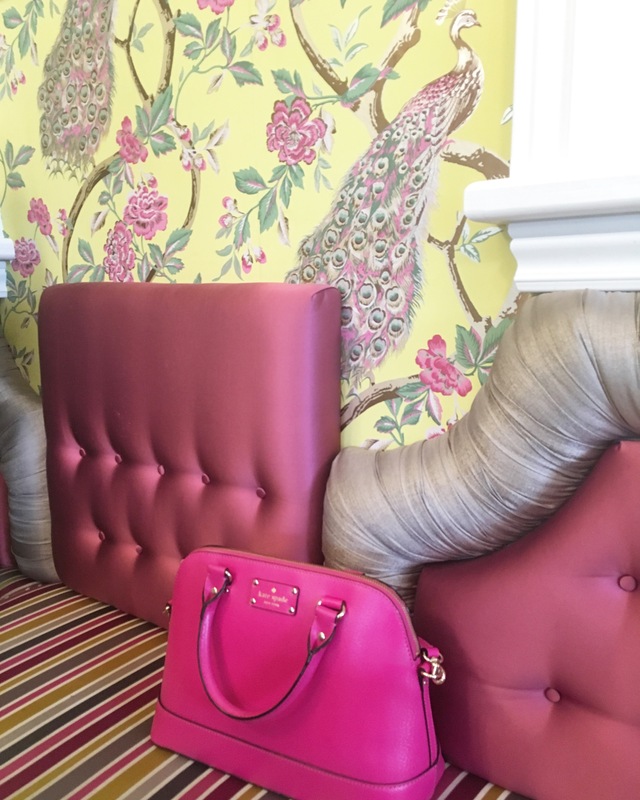 Pink cushions and beautiful green and yellow walls adorned with some pretty fantastic peacock wallpaper! 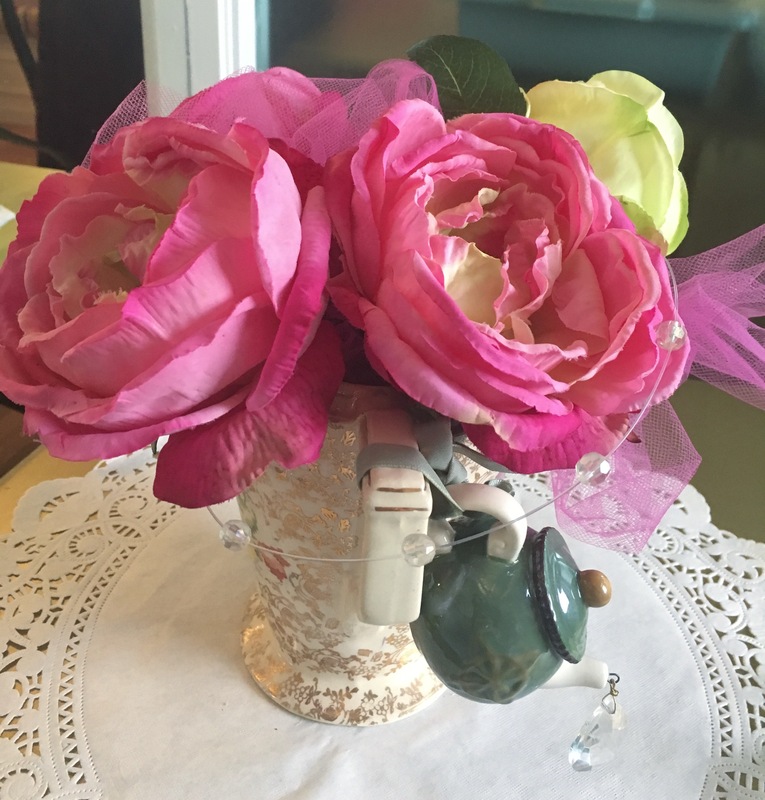 There were beautiful flowers on all of the tables and tons of different tea cups, saucers and pots; I’m such a sucker when it comes to adorable antiques. There are very few tables which is why making a reservation is always recommended. 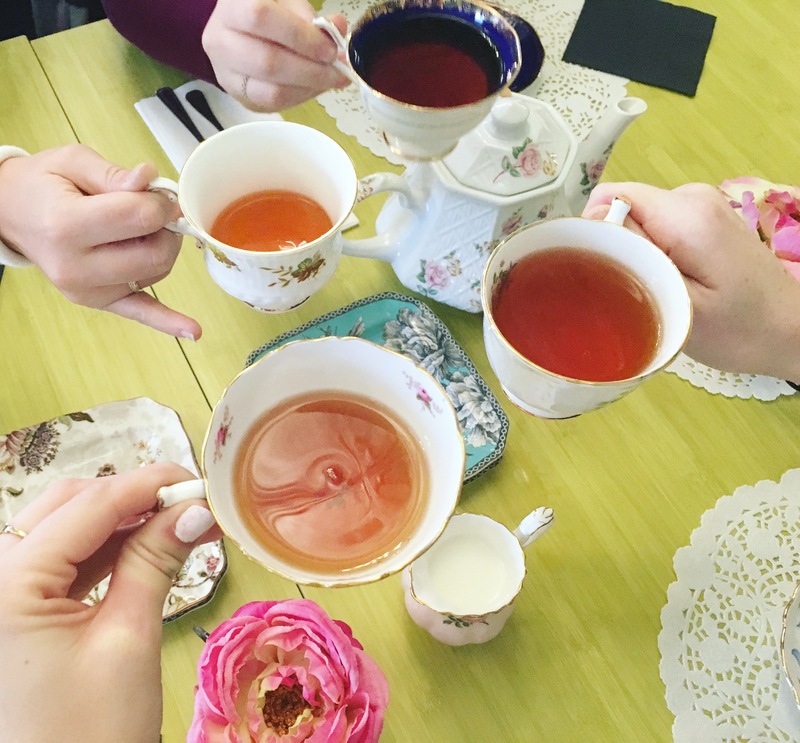 The look and feel of this quaint teahouse made this an even better experience with my friends. 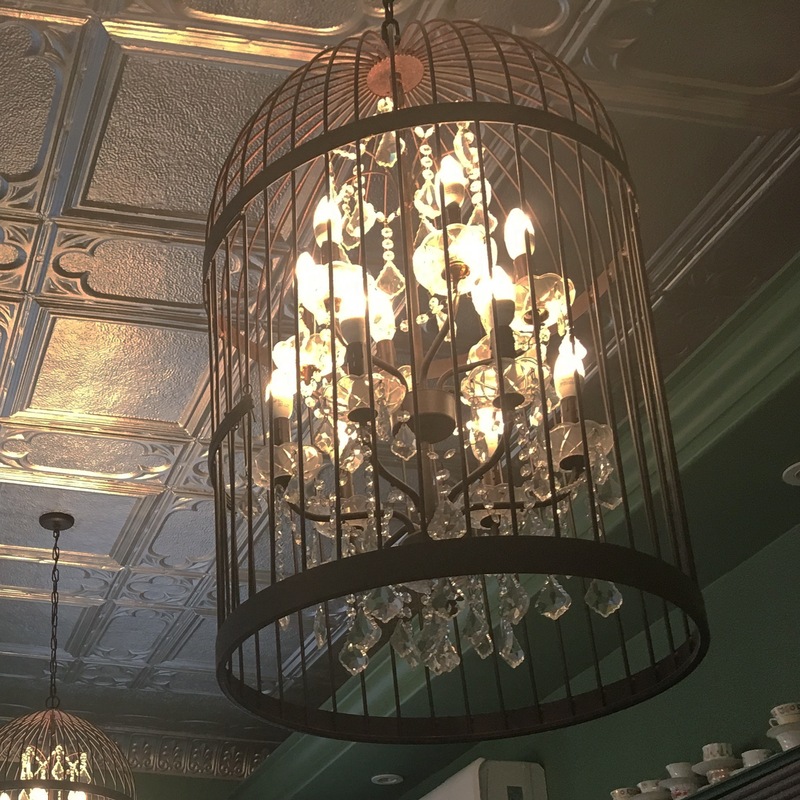 A quick look up and you’ll see a magnificent ceiling with beautiful bird cage light fixtures (one of my other favourite touches inside Abigail’s). The atmosphere is lovely and makes a great location for a bridal/baby shower, birthday, girl’s day. 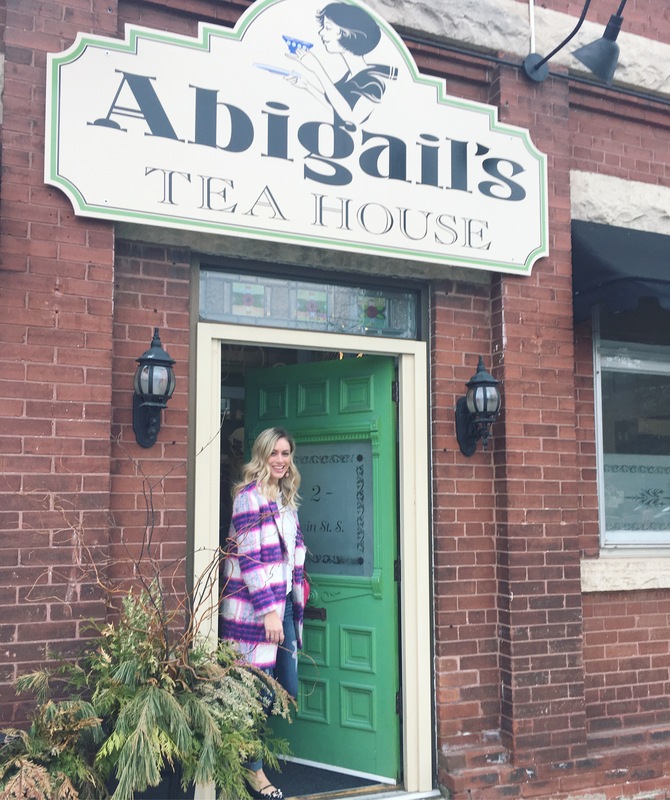 Why not treat Mom to tea for Mother’s Day at Abigail’s? 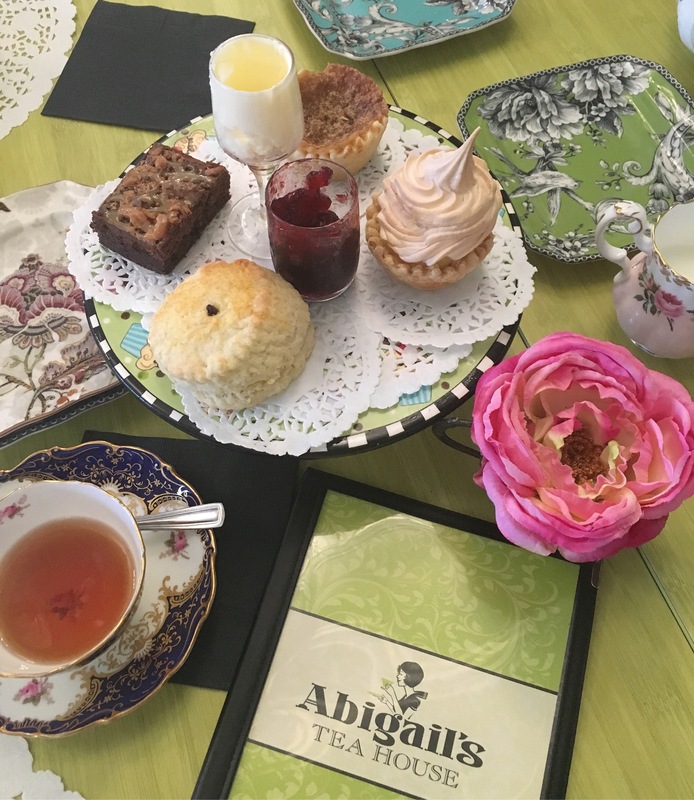 On May 13th and 14th celebrate Mom with Abigail’s Annual Mother’s Day High Tea ($40 per person plus hst and gratuity). 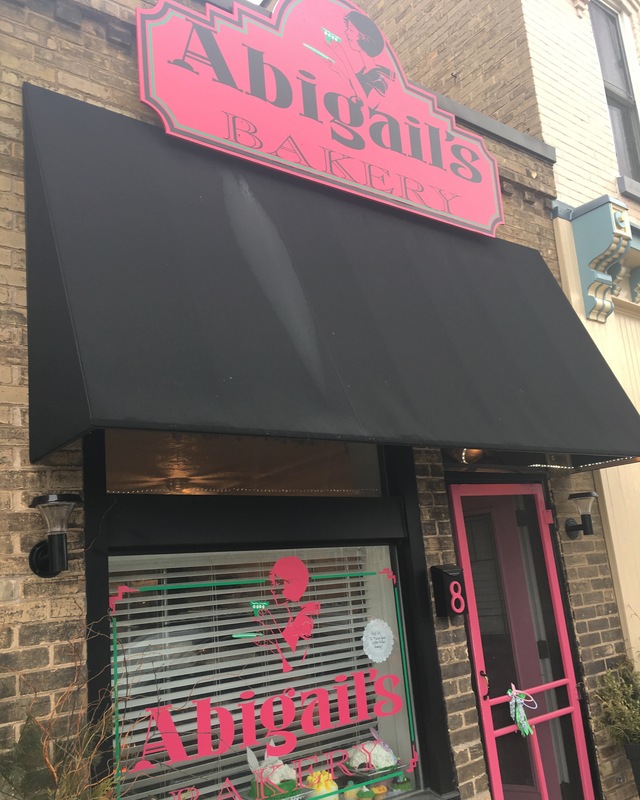 Just a few steps down the street, and I mean a few, lies Abigail’s Bakery where our desserts from the teahouse came fresh from. 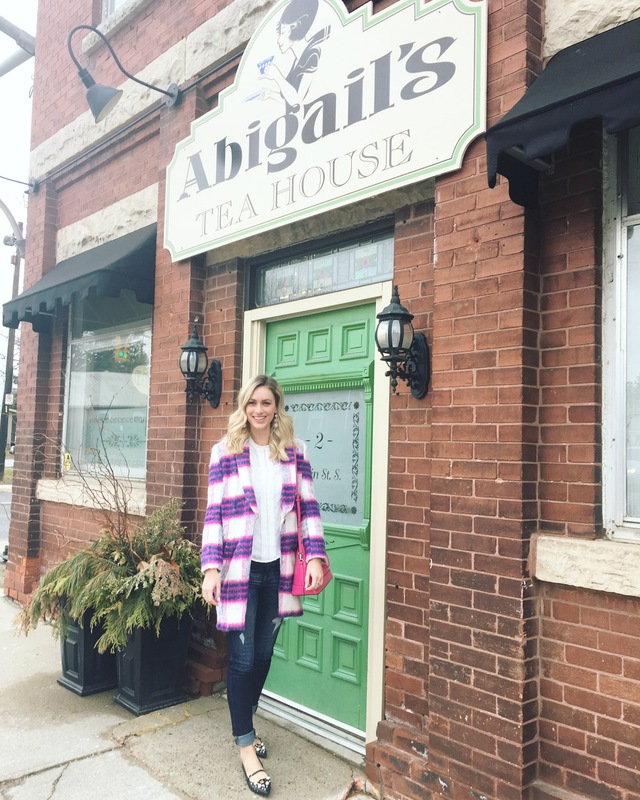 Much like the green door on the teahouse Abigail’s Bakery has a coveted and not to be missed bright pink door! 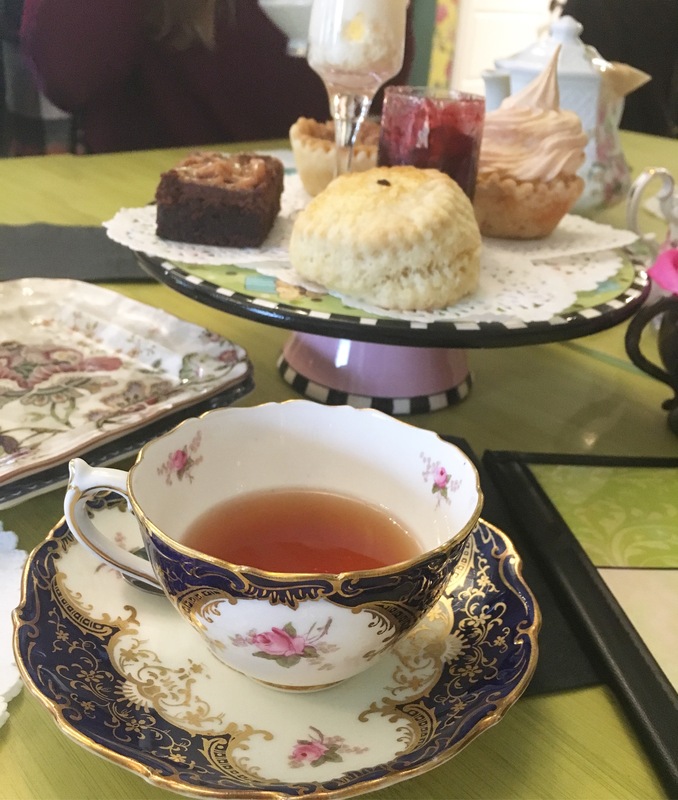 Each of us ordered our own pot of tea and dessert so we could share and try a variety of tea, it was a really good way to do it. 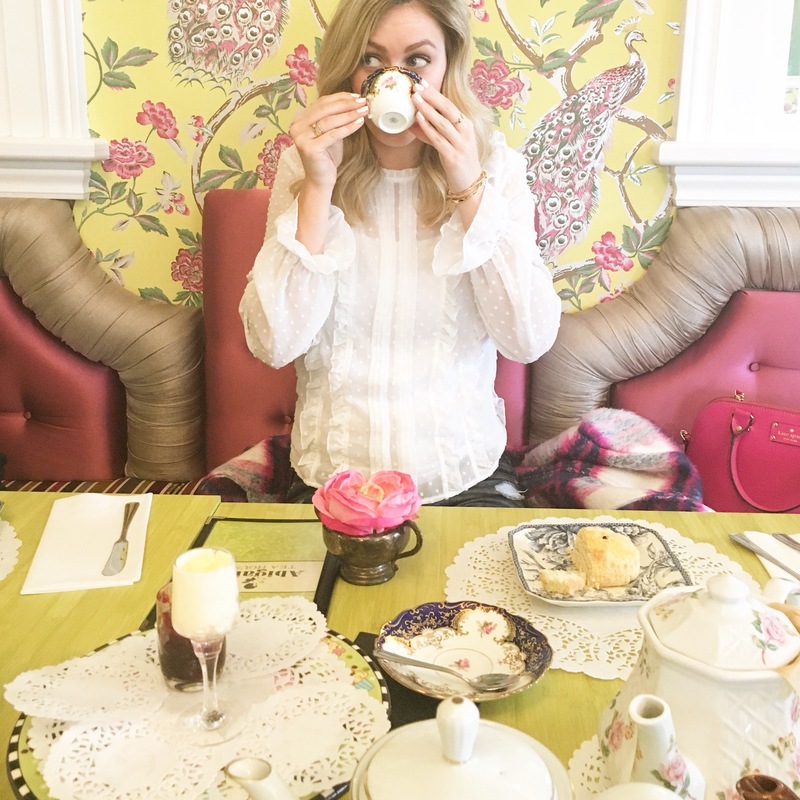 There were around 90 different types of tea. We asked about some of the popular ones and our server listed off ones that matched our tastes. 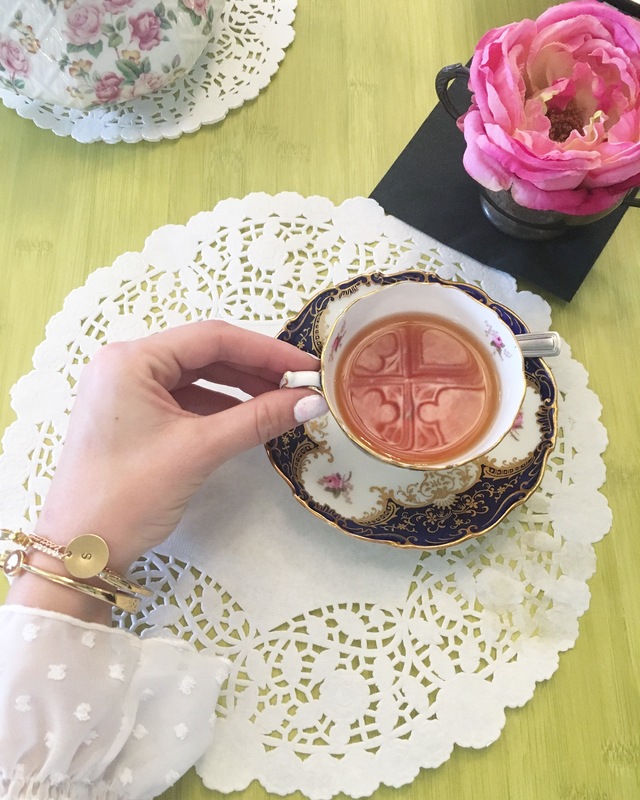 I’m more of a plain tea type of girl, nothing too strong or fruity flavoured so I landed on the black tea with hint of vanilla, it was delightful! 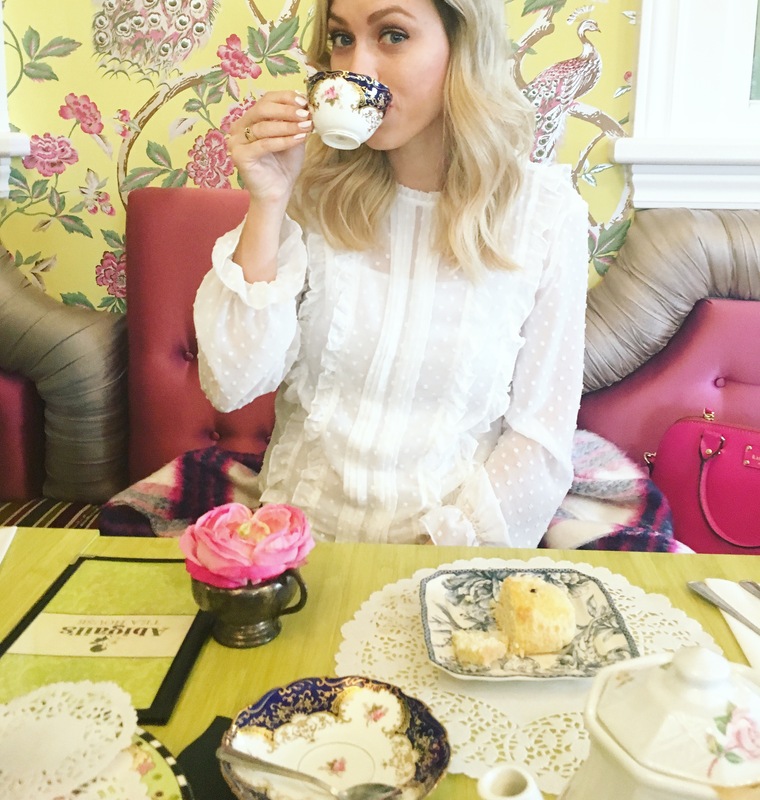 It paired nicely with my delectable scone that came with a side of Devonshire cream and preserve. 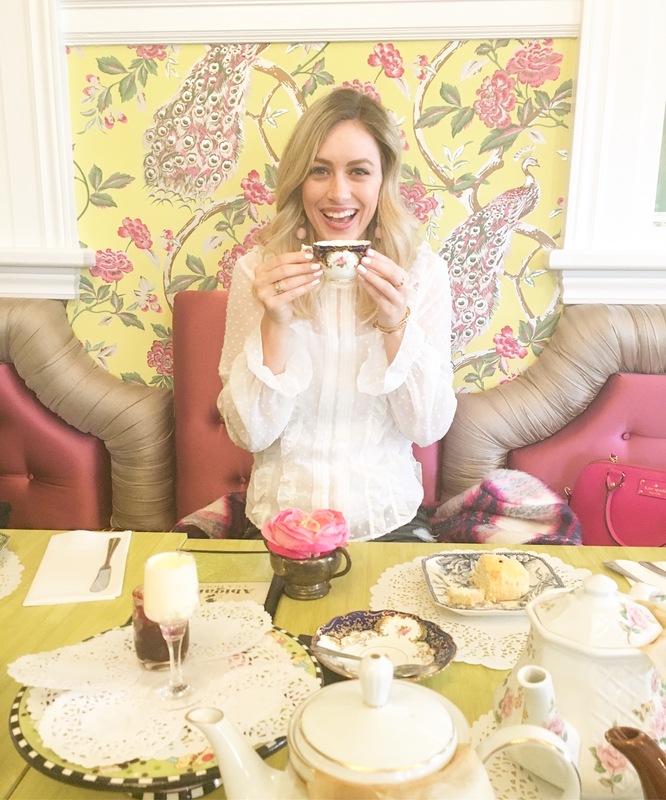 Take a peak at Abigail’s online menu and be prepared to fall in love! Of course I couldn’t go to a teahouse without looking the part! 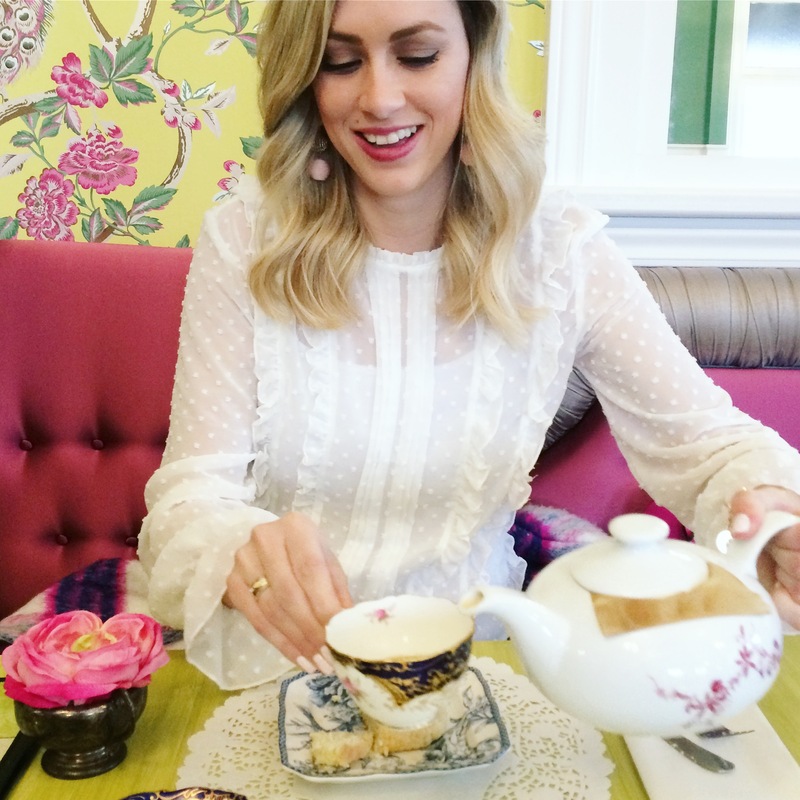 Although the inside of the teahouse stole the show, my bight pink bag and lace top were the perfect compliment to my surroundings. I went for a delicate lace top and kept my accessories simple. The owner of the teahouse actually complimented my top and said she just loves Swiss dot. While we typically have seen Swiss dot on wedding dresses, baby clothes and even curtains, we’re seeing this sheer cotton fabric appear on clothing being sold in stores like Zara, H&M, etc. 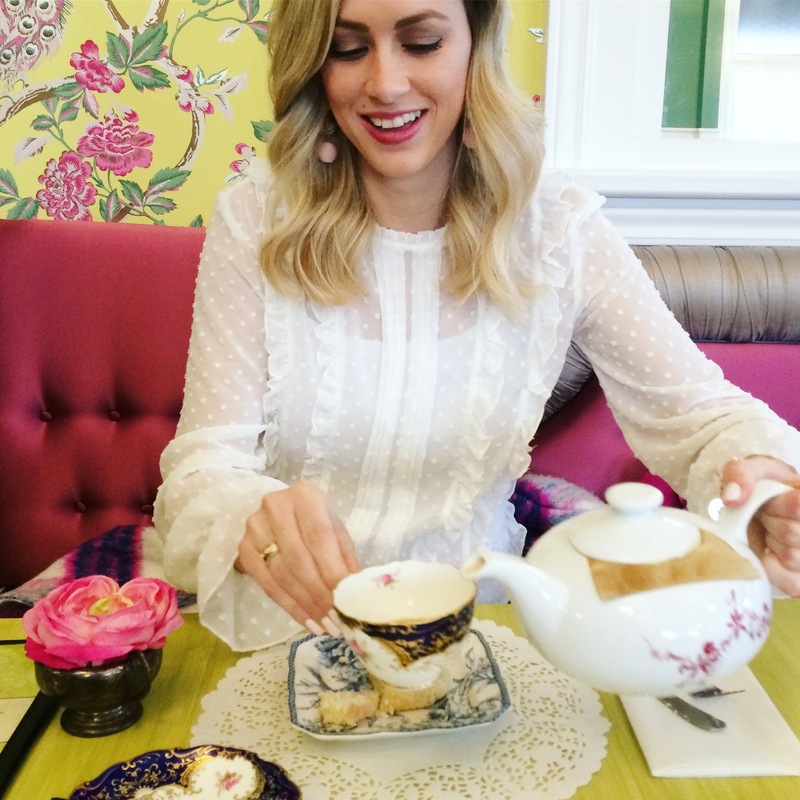 We are going to see a lot of delicate lace fabrics for Spring, I love how feminine they look! 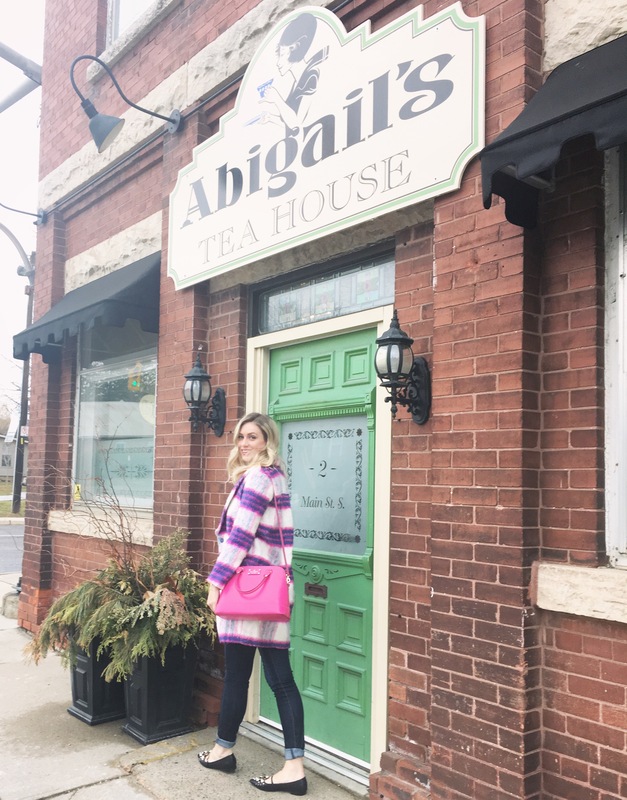 I added a pop of pink (my favourite colour pop) by adding this Kate Spade bag which matched the plaid pattern on my Mink Pink wool coat from Winners. Since my top half was quite simple I went for a fun shoe. 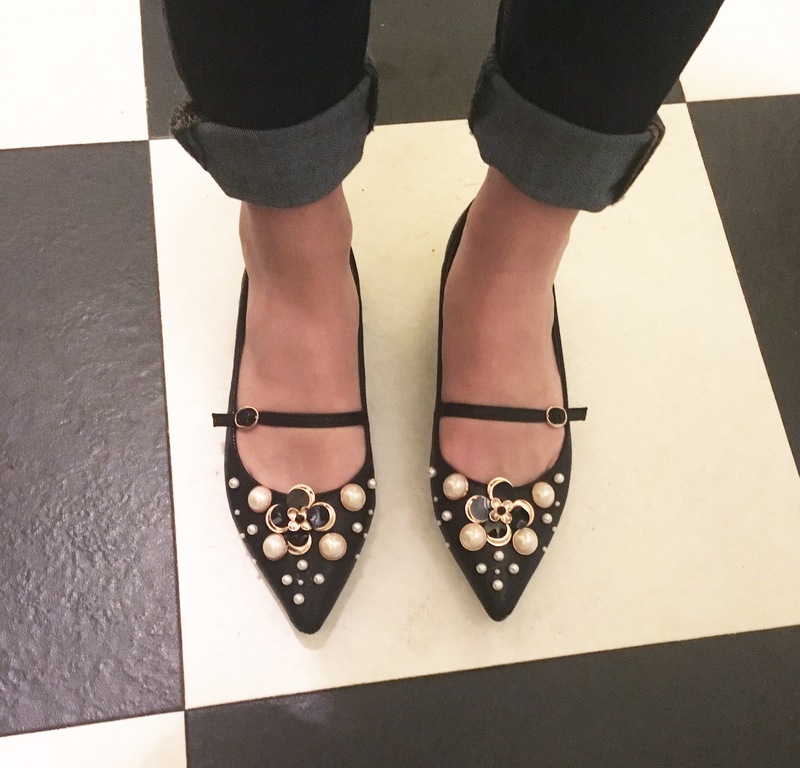 These pearl embellished flats are from Asos and just scream Miu Miu without the high price point! I thought the small floral details were perfect for welcoming Spring. I couldn’t help but photograph them on the black and white tiled floors! 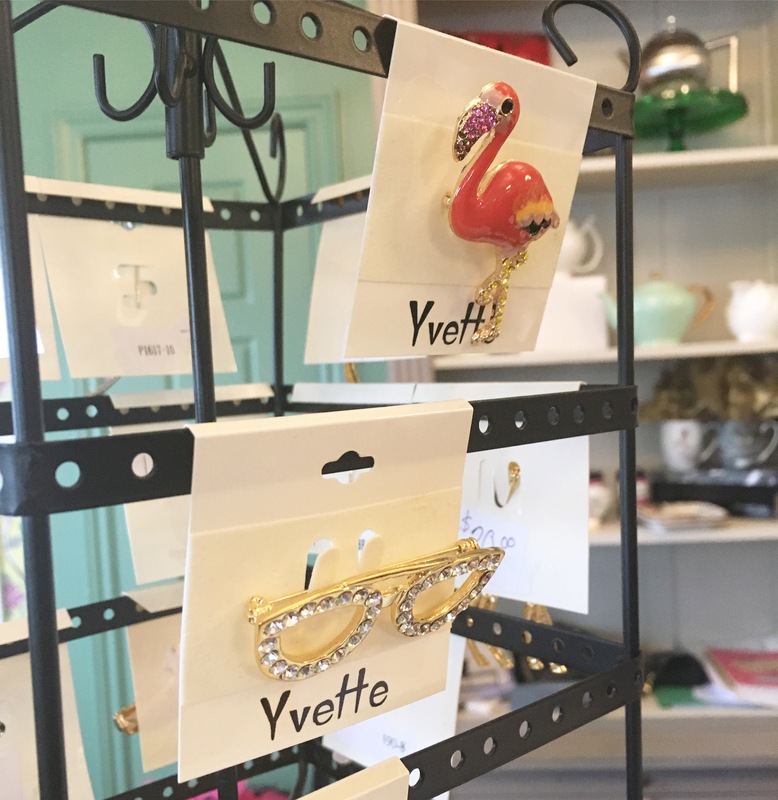 Upon cashing out my eye caught these adorable pins. If I didn’t already love the teahouse, these validated my love once and for all! How adorable does this place look? Your outfit is so cute too! It’s the most adorable! Thanks so much! Obsessed with your entire outfit! I’m not a huge maryjane fan but I love the updated version your’e wearing. Plus, that shirt needs to be in my closet.